At Jarvis, special stems or top plates, unique mounting designs, and custom plating technology have been our speciality for more than 80 years. We specialize in specials. Click the link to the left to browse select custom solutions. Cannot find what you’re looking for? Start a custom solution conversation today. For over 80 years, Jarvis has specialized in caster solutions for the food service and hospitality industries, earning the trust of equipment manufacturers around the world. Featuring a wide variety of NSF-listed wheel, fastening, finish, and size options, Jarvis is equipped to handle even the most challenging of service equipment needs. 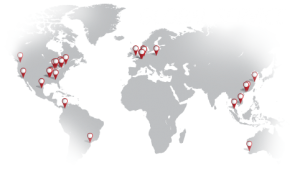 With leading manufacturing facilities located around the world, Jarvis takes a strategic approach to manufacture our products in the regions that best support the needs of our customers. 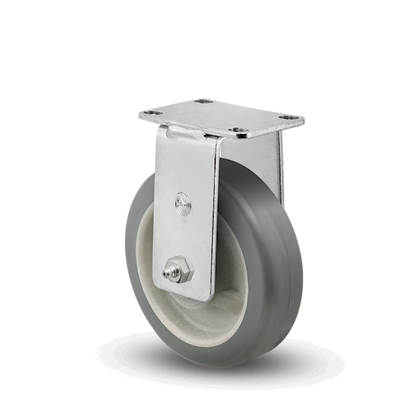 131 Series Casters feature Rigid Top Plates, and support capacities up to 400 pounds each. 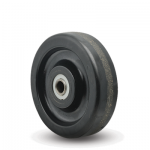 Cushion rubber is non-marking and permanently bonded to a hard rubber wheel core. This economical wheel is recommended for light ot medium duty loads where noise reduction, floor protection, and durability are required. Hard rubber tread wheels feature one-piece molded construction. These wheels have a higher load capacity than cushion rubber wheels and will not flat-spot while sitting under load (compression set). 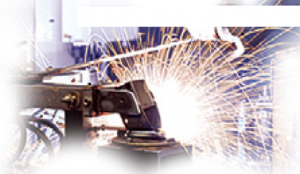 They are non-marking and offer proven performance under a wide variety of institutional and industrial uses. Advantage wheels feature a special modulus thermoplastic rubber (TPR) tread that is permanently bonded to a rugged polyolefin wheel core. All Advantage wheels are non-marking, which reduces unsightly marking and scuffing of floors; the resilient tread material rejects floor debris. These wheels are a good choice for use in wet or damp locations. 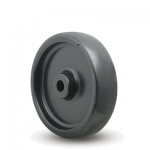 Round treads provide an attractive, crowned wheel that offers superior rolling and maneuverability – ideally suited for a wide variety of food service, healthcare, and institutional applications. Flat treads provide a greater load capacity while maintaining their non-marking and easy rolling abilities – well suited for institutional uses as well as warehouse, industrial, and wet environments. 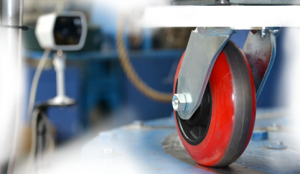 Phenolic wheels are an industry-standard performer with proven service over many decades. 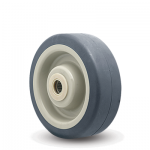 These economical wheels are well-suited to a wide variety of industrial and commercial uses. Phenolic wheels are constructed of compression-molded phenolic resin filled with macerated canvas. They are a hard-tread wheel with high load capacity and are resistant to most oils and other chemicals. 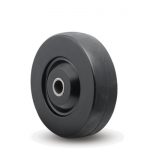 Phenolic wheels roll easier and more quietly than steel or cast iron, providing greater floor protection. 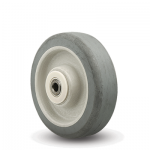 Polyolefin wheels are a lightweight, economical, hard tread wheel that withstands hard impacts and abusive conditions. These injection-molded thermoplastic models are well-suited to a wide variety of institutional and industrial applications. Despite their light weight, their impact strength is superior to hard rubber wheels. Polyolefin wheels are impervious to water, oils, grease, solvents, acids, and many chemicals. 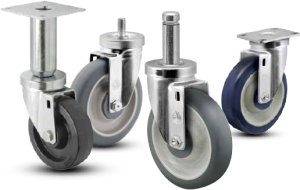 PolyLoc wheels are virtually indestructible and offer a long service life. These models are equipped with single row precision ball bearings for rolling ease. Built-in hub caps are color-coordinated to match the wheel tread for a very attractive, yet functional wheel. PolyLoc wheels either feature a durable grey or dark blue polyurethane tread mechanically locked to a solid polyolefin wheel core. The tread is molded in, around, and through a ribbed wheel core to prevent tread separation when exposed to conditions of water and solvents. VertiLoc® Brake available. VertiLoc is a popular side-operated brake that employs cam action to lock the brake pad across the entire wheel tread surface. This brake locks wheel only, and does not affect the swivel radius of the caster. VertiLoc features an all-steel construction, which provides positive, reliable braking under a variety of operation conditions and wheel tread types. Swivel Grease Seal available. Swivel seals are designed to keep dirt and moisture out of the swivel raceway, and lubricant in, for easier swiveling and longer caster life. They are recommended for equipment exposed to frequent washings or sterilization cycles in hospitals, food processing plants, and bakeries. © 2019 Jarvis Caster. All Rights Reserved. 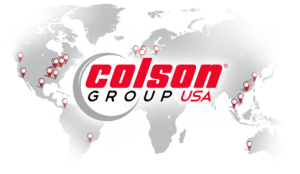 A Brand of Colson Group USA.